Beautiful Coast Guard Beach in Eastham is a spit attached to eroding glacial cliffs. A historic old Coast Guard Station stands watch over the top of the large dune overlooking the beach. Hiking down the beach spit heading south you can see Nauset Marsh to your right, which is habitat for fish, shellfish, shore birds, wading birds, and waterfowl. At the end of the spit is Nauset Inlet, which leads to Town Cove in Orleans. This is a great place to bird watch, view harbor seals, or fish for striped bass or bluefish from the shore. Coast Guard Beach is part of the Cape Cod National Seashore. 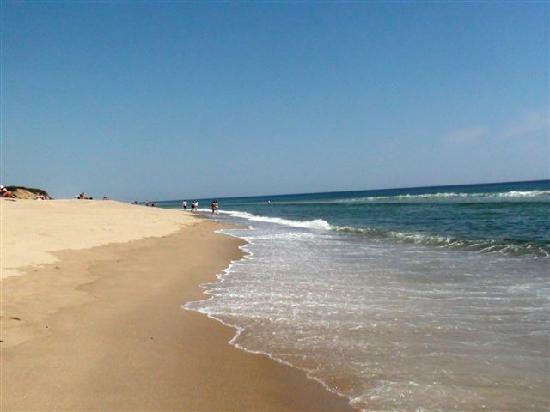 Coast Guard Beach is one of the best surfing beaches on the Cape, due in part to the sand bars that form off the shoreline from the current that draws water into Nauset Inlet. It is also a prime swimming beach. Coast Guard Beach is a favorite for people of all ages. It is often recognized as one of the top 10 on various lists of Americas best beaches, comparable to the best of Hawaii and Florida. Seasonal public restrooms and showers are available at the beach, and a ramp from the parking lot makes it handicapped accessible. The beach has lifeguards. From mid-June to Labor Day, the parking lot at this location is closed, and access is provided by shuttle bus from the Little Creek parking area (across from the Doane Area). Although the parking lot at Coast Guard Beach is open the remainder of the year, parking is limited. How to get there: One and one-half miles East on Nauset and Doane Roads (on road to beach from Salt Pond Visitor Center off Route 6). Look for brown and white signs.